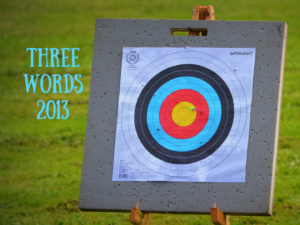 I’d love for my blogging friends to join me in choosing 3 words for the new year! I haven’t had much success with resolutions. We make them, tongue-in-cheek, knowing that we will break them before a month or two have passed. Instead it seems more appropriate to choose a focus for the year. For some, that focus might be summed up in a single word. For others it might take 2 or 3 words to give our year clear parameters. What are the one, two, or three words that create a vision for your future? How do you want to define the year 2013? I’m looking expectantly for God to do more, immeasurably more than I can ask or imagine this year! Intentional: Daily I have 24 hours … just like everyone else. I want to be intentional about how I use those hours. You might say I want to be purposeful about how I use the time allotted. “Teach us to number our days aright, that we may gain a heart of wisdom.” Psalm 90 12. If you are thinking about New Year’s Resolutions, or if you are interested in declaring words to shape your year, please share them! This entry was posted in 3 Words in 2013, Reflection and tagged New Years Resolution on January 2, 2013 by instillnessthedancing.